This Saturday, I volunteered to drive my best friend and her daughter to Girl Scout camp in the Valley. On the way, we passed Lake Lucille and what I’m pretty sure is her church. The camp was absolutely breathtaking. I wished I was eight years old again just so I could stay at the camp. I felt equal parts embarrassed and furious. I am so frustrated with people like this. What The Hell, America? 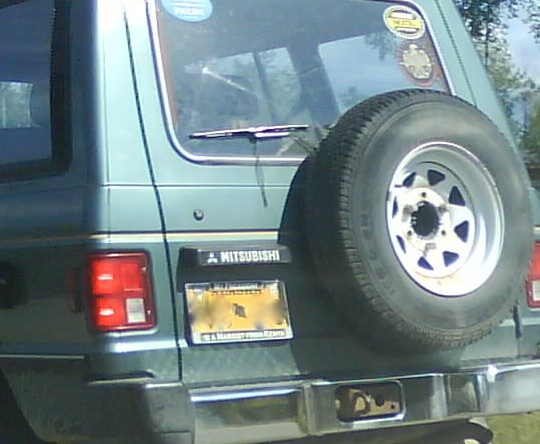 The problem with what the license plate cover said is that it is contradictory. If that person believes Obama is Kenyan and a Marxist, then he isn’t his/her president. Another ignoranus just like Palin. WUA, exactly my point. My comment to my friend was, “I bet he doesn’t even know what a Marxist is.” Idiot. Oh it makes me sad that you had to see that, and that it is common enough that someone made a freaking license plate cover out of it. This is when you look to the sun or the stars or your girl and cleanse the brain. It is really just awful. Michelle, I thought about that too: that someone actually found that cover for sale somewhere and that it’s being made commercially. By golly, I refudiate all “ignoranuses” like the Tundra Turd. You betcha! In the words of Joker: This town needs an enema. There are lots and lots of bumper stickers like that in the valley. I try to always have my pocket camera with me to capture them. Just like you, I use to let them get to me. But now I just have a good chuckle, take a picture, and remind myself who is in the White House and who’s the majority in the Senate and the House. Yeah, baby. Why did McCain this cancer? She has spread her hate all across the land. I live in Tn and their are quitter worshipers. You ask them exactly what will she bring to the table. Answer always that good old common sense. Yes and what is that? Blank stare, huh, huh nothing. I have an Obama sticker on my car and damn dare anyone to say something. Usually nothing they’re only brave with their follow teabaggers. Here is what I don’t understand why are the people so afraid of her. Bring the truth out and set your town free. 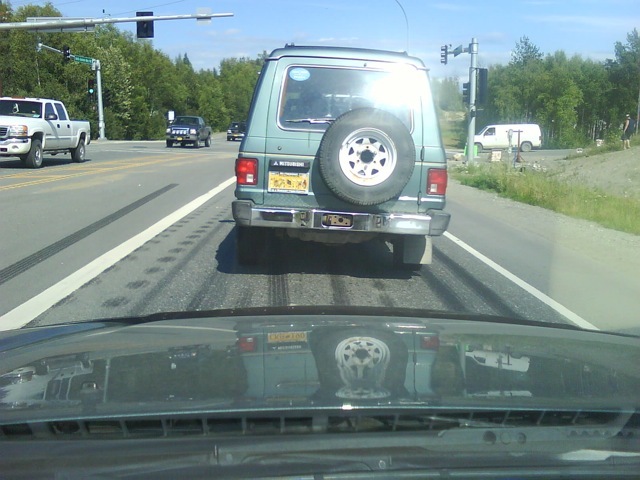 I see them in Anchorage a lot. Alaskans did not always feel so comfortable with this ilk. I truly believe the Valley promotes this behavior and it is a bleeding sore for the rest of us to witness. Erin, I missed your post when it was published. The driver of that vehicle… someone else who wants to take his country back? To what period, I wonder. When women had no vote? When blacks had no vote? When there was no Social Security? What a fool!